Yesterday, The NSW Department of Environment, Climate Change and Water (DECCW) within its Parks and Wildlife Group set fire to over 2500 hectares of remote wilderness in the Greater Blue Mountains World Heritage Area. This deliberate burning was carried out in the name of ‘hazard reduction’ – in order to reduce the available ‘fuel’ (native vegetation) for potential future wildfires or bush arson. Under the orders of the Blue Mountains regional manager, Geoff Luscombe, this deliberate burning was started around Massif Ridge some 12 kilometres south of the town of Woodford in wild inaccessible forested area of the World Heritage Area. Aerial incendiary from a helicopter was used to ignite the forest vegetation floor and incinerate all ground cover and vegetation habitat across a large contiguous area, crossing over creeks and gullies. Fanned by a light southwesterly, the fire incinerated all native ground cover up to the tree canopy for a distance of 5 km into the Blue Labyrinth up to The Oaks Fire Trail. Luscombe ignores the massive natural asset in the region is indeed the Greater Blue Mountains World Heritage Area he is setting fire to. The scale of the forested area affected equates to a 5km x 5km area, or 25km2 – an area about 1/3 the size of Lake Burragorang. Yet, the official Rural Fire Service website typically and misleadingly shows the burn area size as ‘zero’ hectares. The scale of the combined burns was also evident from the blanket of smoke smothering the entire Sydney basin and Cumberland Plain yesterday. This is shown in the following photo from the Sydney Morning Herald. The purpose of bush fire-fighting is to put out bushfires and in the case of wildfires to limit their spread and impact. However, DECCW’s bush burning policy is advocating exactly the opposite. This year up until 19th April 2010, DECCW boasts that it has performed 193 prescribed burns across NSW ‘treating’ more than 56,000 hectares. Last year it manage 168 prescribed burns ‘treating’ a similar 59,202 hectares. It claims this represents one of the biggest ever deliberate burning programs in National Parks’ history. This equates to an area of national parks being burned every year approximating ¼ the area of the Australian Capital Territory; and this is on top of wildfire and bush arson. Every year DECCW contracts helicopters and indiscriminately tosses out incendiary devices over wilderness forests. Thousands of hectares are burnt in a free-for-all and thousands of native animals are roasted. Thank crikey these State-sanctioned arsonists aren’t given access to napalm. DECCW labels its deliberate burning of native vegetation with euphemisms like ‘hazard reduction’, ‘controlled burning’, ‘prescribed burning’, ‘cool burning’ and even ‘ecological burning’. It claims burning vast areas of vegetation somehow ‘assists’ biodiversity, justified on the simplistic premise some species of flora are fire tolerant and grow back. DECCW claims that its burning is essential to manage biodiversity to maintain the reproductive viability of a species or a community of species. DECCW’s ‘eco-logic’ is that since the bush grows back after fire it must be a good impact and therefore good for biodiversity. DECCW terms areas of national parks targeted for such broadscale burns as ‘Strategic Fire Advantage Zones’ or SFAZs. DECCW justifies charcoaling a massive contiguous landscape as ‘assisting’ biodiversity. Luscombe himself has admitted that given the few reliable days a year it is considered safe to burn, DECCW engages in broadscale burning simply a matter of operational convenience. Mosaic burning is too labour intensive and the typically inaccessible gullied terrain and thick forested vegetation of many national parks makes mosaic burning impracticable and too costly. Be clear; it is all about operational efficiency, not ecological biodiversity. Last March, DECCW set fire to 2,200 hectares of native habitat in the Blue Mountains in remote wilderness in Kanangra-Boyd National Park near Jenolan Caves. In April 2008, DECCW dropped aerial incendiaries in remote wilderness just to the north along the Krungle Bungle Range. Like the Rural Fire Service, DECCW is denied serious public resources to detect and suppress wildfires, so it demonises and burns the bush, so destroying the natural asset it is charged to protect and conserve. DECCW has descended into ecological bastardry, imposing a regime of arson fundamentalism upon nature. This is an unprincipled ‘bush-phobic’ culture. 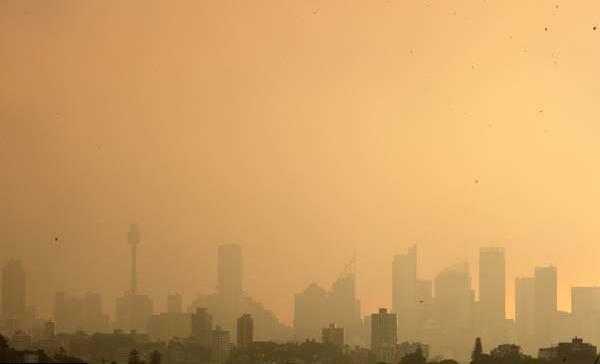 The Sydney Morning Herald reported ‘a rogue breeze drove smoke from hazard reduction burning in the Blue Mountains down to street level.’ It is more the rogue management of the National Parks Service that misguidedly thinks burning vast swathes of bush at once is good for biodiversity. This demonstrates the wanton disregard for native fauna and flora habitat and disrespect for Aboriginal cultural heritage. Large contiguous areas of tens of thousands of hectares severely compromising flora and fauna conservation, potentially causing permanent ecological change and loss of species. In the process, DECCW is destroying natural and cultural heritage values of National Parks, causing long-term ecological damage and driving native species extinction. Collectively, the forested area of the Blue Labyrinth now will lay sterilised of the naturally rich biodiversity of flora and fauna. When the rains come the exposed tops soil will wash away. Watercourses will choke with sediment. The thin fragile soils will change and so change the ability of the soil to replace the complex floristic structure. Only plants that are fire tolerant will recover. Only plants that are hardy to poor soils will recover. There will be less floristic diversity, not more. Ground-dwelling mammals will have had their burrows, dens, nests, shelters burned and destroyed by the fires. Food sources for spotted-tailed quolls, rufous betongs and wombats will have gone. The undergrowth will have gone leaving a bare open charred landscape. Such a disturbed open landscape benefits feral pedators like cats and foxes and wild dogs. Complex and dense ground vegetation reduces the impacts of predators. But the post-fire regrowth takes many months and creates a simple shrub and herb layer. This allows maximum freedom of movement for cats and foxes, and provides minimum concealment for their prey. Territorial mammals and raptors do not simply relocate. They remain in their territory and have to compete with these feral predators. Many die. As top order predators like quolls and owls die, this alters the food chain and contributes to local extinctions. Such broadscale deliberate burning of forest habitat is a threatening process driving Australia’s mammalian extinctions. Australia has the worst record of mammalian extinctions of any country on Earth, with nearly 50% of its native mammals becoming extinct in the past 200 years. Australian native fire tolerant fauna (‘pyrophytes’) like most Eucalyptus, Acacia, Proteaceae, Xanthorrhoeaceae and many native ferns and grasses recover quickly after bush fire. However not all species of Eucalypt are fire tolerant (or ‘pyrophobes’) as commonly assumed. Eucalyptus parvula, Eucalyptus saxatilis and Eucalyptus tetrapleura are not fire tolerant. Also, some species of Acacia are not fire tolerant such as Acacia georgensis and Acacia chrysoticha. Flora diversity varies with soils, aspect, topography and other factors. The Blue Labyrinth is characterised by a labyrinth of ridges and gullies, hence its name. Flora along riparian zones is generally wetter and not as well adapted to fire as ridgeline flora. Yet DECCW’s one-size-fits-all blanket broadscale burning of 2500 hectares up hill and own dale completely disregards the complex biodiversity variations between the gullies and ridgelines. What its blanket burning yesterday has done to the Blue Labyrinth, however, is indeed to have encouraged a consistent simpler form of regrowth vegetation – that is, less biodiversity. Obviously no animal species is fire tolerant. The Blue Mountains provides habitat to many native mammals including Yellow-bellied Gliders, Koalas, Feathertail Gliders, Eastern Pygmy-possums, Brush-tailed Rock-wallabies, Spotted-tailed Quolls and Antechinus. What happens to these mammals when caught in burn-offs? Where are the native zoological surveys before and after reports for each of these burns? Native mammals and raptor birds are territorial and do not relocate and typically perish. Broadscale unnatural fire regimes produce unnaturally high biomass, but not true biodiversity. DECCW’s policy has bad biased biodiversity and fire ecology science to support its simplistic economic approach to bushfire management. DECCW has lost its way as a custodian of protected areas. It is now charged with priorities for exploitative tourism. Land clearing and frequent broadscale bushfire continue to put many unique species of Australian wildlife at risk. Over the last two hundred years many species of plants and animals have become extinct. DECCW as trusted custodian of NSW’s natural wild areas and in increasing its frequent broadscale burning is possible the greatest contributor to species extinctions across NSW. The DECCW is charged with custodial responsibility for environmental conservation and protection of the national parks and reserves under its control. DECCW is the lead agency responsible for environmental management of the Greater Blue Mountains World Heritage Area (GBMWHA). The GBMWHA Strategic Plan provides management principles and a framework for the integrated management, protection, interpretation and monitoring of the heritage values. “where there are threats of serious or irreversible damage, lack of full scientific certainty shall not be used as a reason for postponing cost-effective measures to prevent environmental degradation”. Aerial incendiary to indiscriminately burn 2500 hectares of remote wilderness is clearly an impact causing serious and likely irreversible damage to important faunal habitat. Such bush fore management practice on a large congruous scale clearly lacks scientific certainty. In a CSIRO Journal of Wildlife Research, Michael Clarke, associate professor in the Department of Zoology at La Trobe University says it is reasonable for land management agencies to try to limit the negative effects of large fires and to be sure they do not lead to irreversible damage to native wildlife and habitat. Much hazard reduction is performed to create a false sense of security rather than to reduce fire risks, and the effect on wildlife is virtually unknown. The sooner we acknowledge this the sooner we can get on with the job of working out whether there is anything we can do to manage fires better. We need to know whether hazard reduction can be done without sending our wildlife down a path of firestick extinctions. Clarke has called for the massive burn-offs to be scrutinised much more closely. He wants ecological data about burns collected as routinely as rainfall data is gathered by the agricultural industry. Without it, hazard reduction burning is flying scientifically blind and poses a dangerous threat to wildlife. The incinerating of 2500 hectares of remote bushland in the Blue Labyrinth yesterday was not to protect the houses and properties of Woodford some kilometres away. Such broadscale deliberate lighting of thousands of congruous hectares of native forest habitat is not protecting houses. This is not clearing dead vegetation around properties. It was fuelled by an unquestioned vandalistic compulsion to burn any bushland that has not been burnt, simply for that reason and that reason alone. The bushfire management call it strategic. But it is a cultural bush-phobia – a fear and lack of respect for the natural landscape. It harks to early Australian colonial mindset that feared the bush to the extent that one had to tame it else invite wildfire Armageddon. The Blue Labyrinth is a rugged natural region of forested hills and gullies a few kilometres south of the central Blue Mountains village of Woodford. It is an area of ancient Aboriginal culture. There are caves in the area displaying Aboriginal rock art dating back tens of thousands of years. 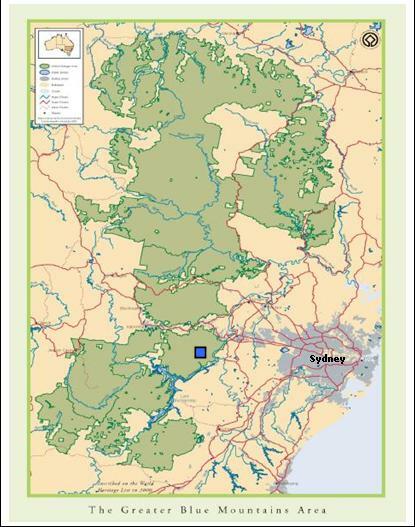 In February 2006, DECCW’s Aboriginal Heritage Information Management System (AHIMS) collated an official record of indigenous archaeological sites across the Greater Blue Mountains World Heritage Area. It listed some 850 discrete archaeological sites and 973 features in the GBMWHA, representative of past indigenous activities that remain in the landscape and are essentially the “Aboriginal archaeological record”. In December 2006, leading world rock art expert Dr. Jean Clottes to dozens of sites across the GBMWHA and the central coast. 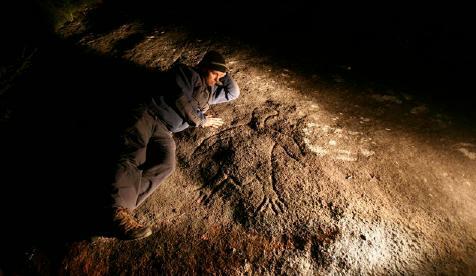 Clottes was recently appointed to UNESCO to advise the institution on the creation of a World Heritage Rock Art List. He was so impressed with the GBMWHA rock art sites, and associated contemporary Gundungurra, Darug, Wiradjuri and Darkinjing stories that he considers the Area to have world Heritage significance. Indeed, it was the living connections to the sites and larger landscapes that most impressed him. 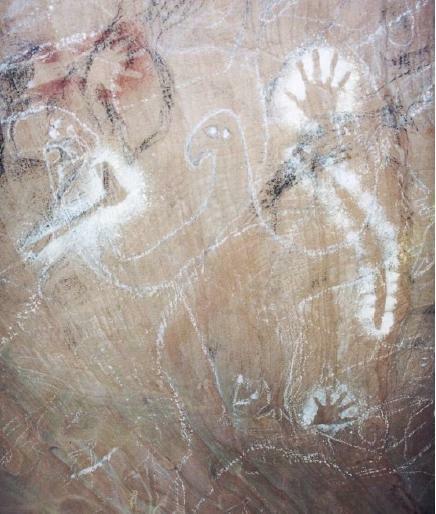 Rock Art at Bora Cave in the Blue Labyrinth is an example of important cultural connections of the local Gundungurra and Darug to the area. Through the Mapping Country research in the Blue Labyrinth area of the Blue Mountains National Park, hundreds of Aboriginal cultural places were recorded. The BMHWI highlighted in its 2007 report the risk of damage by natural environmental processes and exposure to modern human activities. Particularly highlighted was the risk posed by an increase in the frequency and intensity of wildfires and… and efforts to control fires can damage or destroy rock art sites. By locating and mapping sites they can be catered to as part of fire management strategies. Yet, it would appear from anecdotal evidence that DECCW failed to contact the traditional Aboriginal owners of this land to inform them of the planned burning. It is likely with such indiscriminate broadscale burning that some of the cultural sites may have been irreparable damaged. What happened to Attic Cave, Dadder Cave and the Aboriginal archaeology between the Massif and The Blue Labyrinth? Was it burnt out and destroyed by DECCW’s needless incineration? What happened to the wildlife and wildlife habitat? DECCW these days is more a patsy of NSW Labor right wing economic rationalism focusing on tourism revenues, than it is on its core ecological wildlife conservation raison d’etre . This entry was posted on Wednesday, May 12th, 2010	and is filed under Blue Mountains (AU), Threats from Bushfire.